Abstract: In this article, I begin with section 1 by presenting the five main sacrifices found in the first seven chapters of Leviticus, including their relations to the requirement for Israel to be holy. 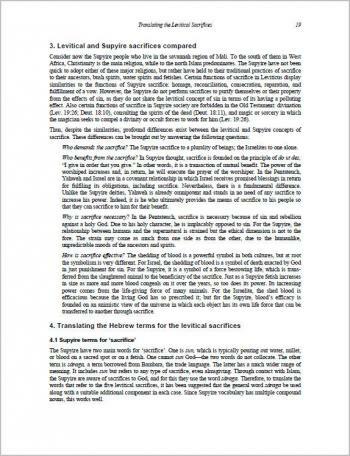 In section 2, I describe the functions of the levitical sacrifices, and in section 3, I compare these with the functions of the multifarious sacrifices carried out by the Supyire people in southern Mali. After arguing the case for translating the functions rather than the forms of the levitical sacrifices (contra the majority of English translations), I present, in section 4, suggestions for Supyire renderings of the sacrifices based on their functions.